A special workshop with Malaysian Artist – Takahara Suiko from The Venopian Solitude! Anyone can start writing lyrics and composing melody even if you do not have formal music background or know how to play an instrument. It can even be done just using your smartphone! She started off as a bedroom singer-songwriter and officially kicked off her music career in 2013. 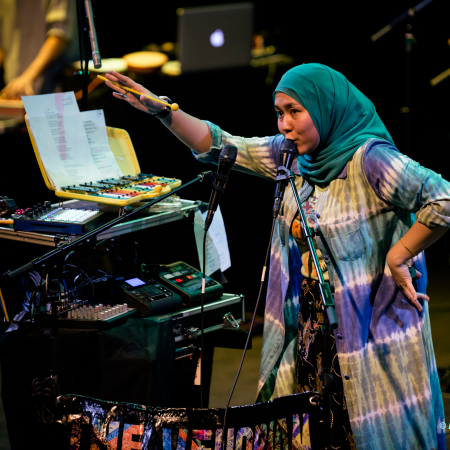 She later formed her band, The Venopian Solitude and debuted their album ‘Hikayat Perawan Majnun’, which they were nominated for Best Engineered Album, Best Arranged Song and Best Music Video in Anugerah Industry Muzik 2014. Later in 2016, they won Best Hip Hop Song in AIM 2016 for the song ‘Janji’ in collaboration with Altimet. The Venopian Solitude went on a European Tour in 2018 namely TVStoEURO and completed 7 shows in 6 countries. Three of their songs were also featured in Netflix documentary – Shirkers which the film was shortlisted for the 91st Oscars Documentary Feature. Produce your original song using your Smartphone! *You can choose which session to attend. Only few seats left!